Add style and function to your living space with the South Shore Prairie 2-Door Chest/Armoire. It's extremely functional and provides extra storage space. This wood armoire with drawers is ideal for a living room for holding books, movies, blankets, remotes and more. It is also suitable for a bedroom to store extra linens or clothing. This wood armoire wardrobe features antique-style metal handles and a light finish. It also has three storage spaces behind the doors that are separated by two adjustable shelves. The South Shore Prairie 2-Door Chest/Armoire can be used with a variety of home decor styles. Only thing I didn't like that made me quite irate was 4 screws for the 2nd drawer was not in bag and I had to run to Lowes to get something that would work. I have a very small kitchen and my husband asked me to pick out an armoire to use as our pantry. I picked this one because of the simple design and the hardware on the drawers and cabinet. Let me tell you - this piece is absolutely perfect. The color is exactly what you see and the size is perfect too. It has shelves inside so it will serve its purpose in my kitchen as a pantry. If we ever move, I plan on using this as my bedroom furniture. LOVE IT!!! Do not hesitate on this purchase. I bought this item to use as an entertainment armior. I wouldnt suggest using it for that purpose. A small flat screen will fit in it but you have to drill your own holes. But the doors dont go dont open all the way back so they tend to get in the way. But, that is no fault of the product. I didnt read the description. I ended up putting my tv on the very top its actually works out well. I also got it to use for extra drawer space. The drawers are great. With plenty of space. I would reccomend this product for extra storage and it looks really nice too. Looked all over the internet before going to Walmart.Was great to purchase merchandise that the larger stores carry & have it shipped to my local store. This was exactly what I was looking for, right color, style, and size. BINGO. Great instructions, had together in no time. I already have one of these armoires in the bedroom which I use for storing sheets, blankets, etc. I needed a piece of furniture for my screen porch to hold my dishes and linens and thought that this armoire would be a great addition to my porch. And I was right. It is a beautiful piece of furniture and it is doing what I wanted it to do. It holds my dishes on the 3 shelves and my tablecloths, etc. fit in the 2 drawers that are on the bottom. I would recommend this product to anyone needing additional storage space. Great value and easy to assemble. I bought Armories similar to this in the past. Easy enough to put together. the draw slides are plastic. Directions can be difficult to follow. plenty of space inside for sweaters, blankets, etc. drawers are small. the decorative kick board was broken in half when I opened the box. it is very cheap particle board. good enough for now but can be left behind when moving. carton came torn and smashed on the corners, big dent on right side door, 1 door handle did not have threads to install the screw, bottom front board was rubbed into product, shelf brackets are cheap plastic, drawer rails are cheap plastic(replaced with metal), should have refused from Fed-Ex deliivery. I am a handyman so I just fixed their screw ups to save the hassle. Does exactly what I wanted it to do. Not too hard to put together. Finish has several defects but I guess the sayin is right,,,,, you get what you pay for. Looks average seems poor due to plastic parts! The plastic parts need to be replaced with metal parts and the drawers should have had middle supports. Its fair but I was really looking forward to it being better without me having to go out and buy extra parts. For the money... I did not get what I paid for. This was worth $69.99 And thats just for the nice wood that was supplied. I have to go out and purchase the added things this armoire need to make it worth what I paid walmart. Im not really happy with it. Poorly manufactured piece of furniture. The directions say NOT to put a regular TV on it. That was my first clue that this may be poor quality. It is terribly unstable. There are three pieces of cardboard on the back (two of them taped together by South Shore) to stabalize it. That doesn't work. The south shore rep I talked to had no explanation for this and suggested I could make it more stable if I tighten the screws. Really? The doors have a big gap between them. One door is higher than the other because of poor manufacturing where they drilled the holes in the wrong place to hang the doors on the hinges. Oh, and when the doors are open, you can see in between the pieces of cardboard on the back to the wall behind it. My favorite part is that the rails/tracks for the drawers are PLASTIC! One of them came melted or something, so I'm waiting on a new one. I know they still make metal rails because I just bought another piece of furniture with drawers and the rails/tracks are metal and glide! Don't waste your money. There are much better quality door chests/armoires for the same price or cheaper but my wife wanted a matching set. Unfortunately, we bought the entire collection and are stuck with it. There are problems with another piece as well. Do the doors hide? Do they slide inside? 2. Nope, the doors open even with the sides. They stick straight out when opeend and they don't slide in or even open all the way around to rest against the sides. Also it is rickety, unstable, and there is always a 1/4" gap between the doors when closed. 3. Doors open and close but do not slide inside. 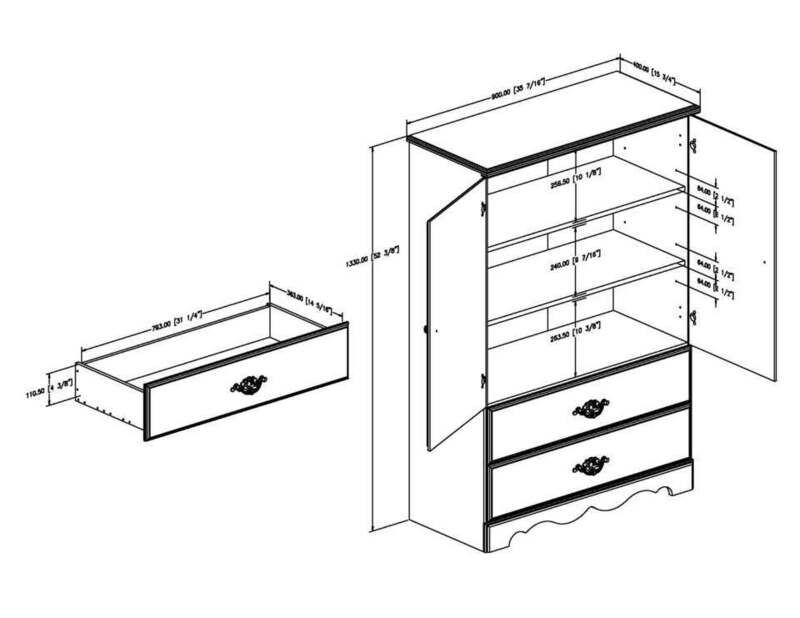 How many shelves are in the upper portion and are they height-adjustable? is there a rod to hang cloths on top, Like a closet area for a room with no closet? 1. No there is no rod. Behind the doors you will find shelves only. 4. That is exactly what I was looking for, but no, there is no rod. I went to Lowes and bought one and with a few screws just attached it to the inside. It works fine now, for small kids clothes. 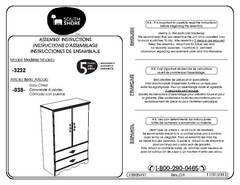 Warranty Information:South Shore Industries Ltd offers the original buyer, for a period 5 years from the date of puchase, a warranty against defects on all the component parts of the furniture for both parts and labour. Exceptionally, any component part damaged during the initial assembly by the owner is covered by this warranty. The term defect as it is used in this warranty is defined as an imperfection that may affect the use for which the product is intended. This warranty is strictly limited to the repair or replacement of defective component parts, exluding all other direct or inderect charges up to the limit prexcribed by law in the distric where you reside.If a replacement part cannot be obtained, the liability of South Shore Industries Ltd. to the buyer cannot exceed the value equivelent to the prodluction cost of the part in question. This warranty applies under normal domestic conditions for use, and does not cover defects resulting from commercial use, intentional damage, neglect, abuse, personal modifications, an accident, exposure to the elements, and maintenance that does not comply with the instructions in this brochure. As a condition to providing a replacement part, south shore Industries Ltd. reserves the right to ascertain the basis for a request, and to demand proof of purchase from the original buyer. This warranty is only valid if is made from an authorized retailer for South Shore Industries Ltd. in Canada or the U.S. This warranty defines the limitations of the liability of South Shore Industries Ltd and entitles the original buyer to specific rights. Any warranty legislated by law in your district of residence is limited to a period of 5 years. IF this restriction is not permitted by law in your district of residence, it does not apply. South Shore Industries Ltd does not give reimbursements for defective furniture but replaces it with an item of equivalent value.